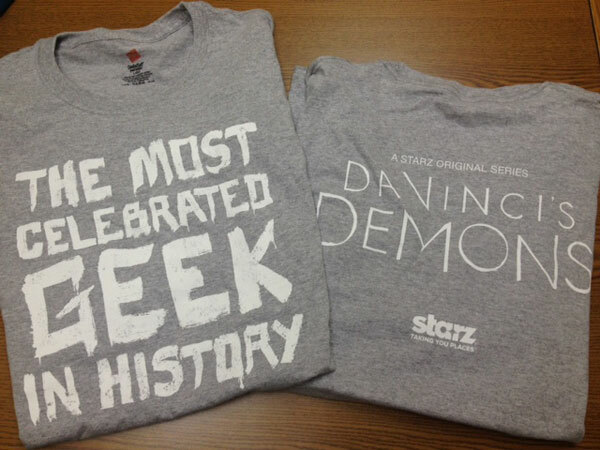 Next week, Starz is releasing its epic freshman drama, Da Vinci’s Demons, on to Blu-ray and DVD for the first time. 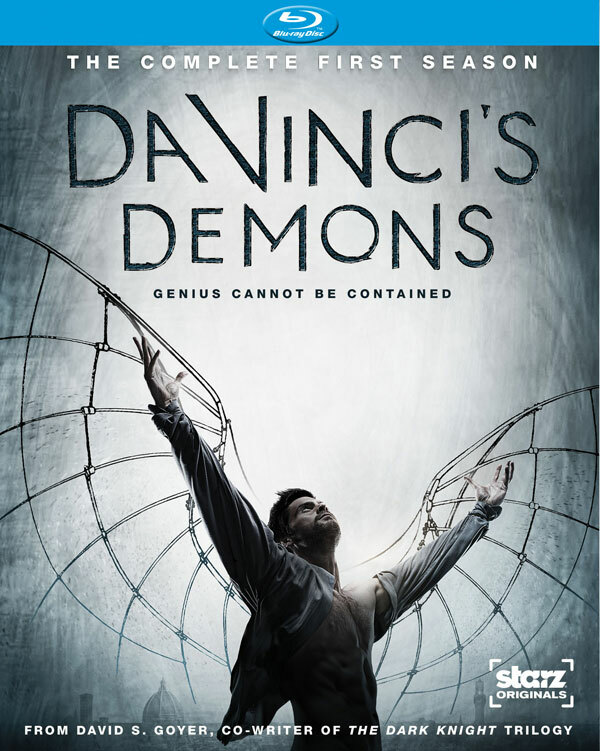 Da Vinci’s Demons: The Complete First Season follows a young Da Vinci and his adventures as a painter, sculptor and inventor. Anchor Bay Home Entertainment is releasing the set on September 3, and to celebrate, we are giving away an extensive Blu-ray prize pack featuring a Blu-ray copy of the first season, along with a t-shirt and a pen & pencil set to help you in all of your artistic endeavors. The Blu-ray is clearly the big prize, and will be coming with a slew of bonus features, including deleted scenes, audio commentaries, and several featurettes. If you want a glimpse at those featurettes, you need look no further than the behind-the-scenes video, below, which introduces us to the show’s composer and explains his mindset while creating the music for Starz’s hit new drama. He used the concept of Da Vinci writing forward and backwards to come up with some sweet music. I know you are dying to take a look at the swag, as well and I won’t make you wait any longer. Everyone can always use a basic t-shirt, but the pen and pencil set is just cool and even comes with a nice little holder and a pencil sharpener. 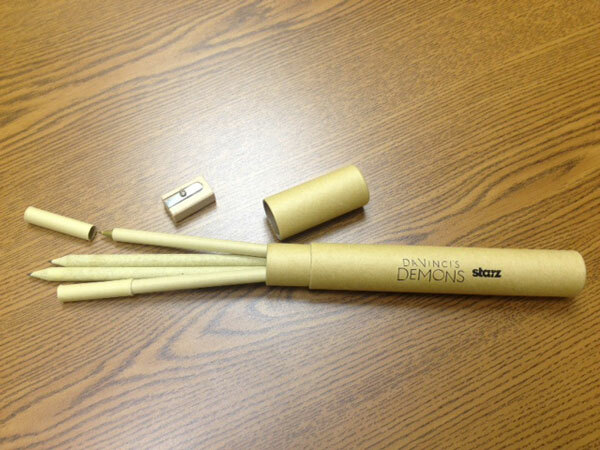 Plus, the pens and pencils don’t look like they are of the 10 cent variety, which is pretty great. Entering is easy. Just click on over to our Facebook Giveaway Post, "Like" our page if you haven't already, and then leave a comment on the page telling us your favorite invention of all time and why! The giveaway ends at 11 p.m. ET on Wednesday, August 28. If you enter, please make sure we can contact you via Facebook. If you have it set to where we can't contact you, your prize will go to somebody else. If you are not feeling confident in your winning capabilities, you can always order Da Vinci’s Demons: The Complete First Season over at Amazon, where sets are available for pre-order at a very reasonable price. Whichever way you get your hands on a copy, Season 1 is totally worth a perusal, especially since the show will be returning to Starz’s schedule in 2014.